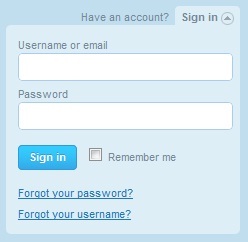 Signin box in the Twitter website is something new and unique, Once we click on the signin button, it will open the login form in dropdown, this design is very useful for space utilization in the webpage as well as better look and feel and unique. We can develop the same kind of sigin forms using JQuery. Check the following article for the detailed explanation.